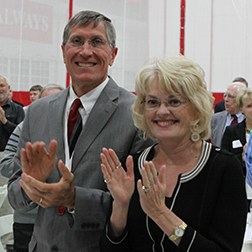 Nine Little Giant legends were inducted in the Wabash College Athletics Hall of Fame, including individual All-Americans in football, swimming, and wrestling, and a three-time state champion basketball coach. Inducted Friday, November 14 were Chris Healy '05 in wrestling, John Hollett '59 in tennis and basketball, Andy Luckey '93 in swimming, Steve Mihalko '69 in football, diving, and track and field, Gene Miiller '75 in basketball, Adrian Pynenberg '08 in football, Eric Schoettle '93 in football, Eric Snively '94 in football and baseball, and Chris Wiesehan '94 in football. Read all of the induction citations here. Healy became the Little Giants' first two-time All-American wrestler, finishing second at the NCAA Championship Tournament at 174 pounds in 2005 after earning an eighth-place finish in 2003. He posted a career record of 159-35, setting the Wabash mark for the most victories. Hollett was a two-time MVP as a member of the Wabash tennis team. He came to campus as an acclaimed high school player, winning the Indianapolis Junior Tennis Meet championship. He continued his excellent play at Wabash by helping the Little Giants to nine wins, including victories over Memphis State, Indiana State, and St. Joseph. Hollett was also a three-year letterman on the basketball team and averaged 9.3 points and 6.6 rebounds as a senior. A five-time All-American, Luckey set individual records in the 200 and 400 individual medley as a member of the Wabash swimming and diving team. He was also a member of four record-setting relay teams. Luckey was team MVP in 1992 and co-captain in 1993. Over four years, Luckey helped Wabash to a 37-0 dual meet record, two top-10 finishes at nationals, and 20 invitational championships. Mihalko starred in football, swimming and diving, and track field for the Little Giants. He held school records as a diver on both the one- and three-meter boards in addition to being part of a record-setting 440-yard relay team in track. AS a football player, he caught 72 passes for 1,107 yards and seven touchdowns and still ranks in the top-30 in Wabash history for receiving yards. A legendary basketball coach in the state of Indiana, Miiller has guided Washington High School to state titles in 2008, 2010, and 2011. He also led Vincennes High School to the championship game of the 1984 state tournament with a 24-4 record before losing to Warsaw. A star as high school player at South Newton High School, Miiller played three seasons at Wabash before becoming a high school coach and teacher. He is one of six active Indiana high school coaches to win 600 games (621) and currently ranks 12th all-time in victories. He was inducted into the Indiana Basketball Hall of Fame in 2012. Pynenberg was a three-time All-American and Gagliardi Trophy finalist as one of the top football players in Division III. He broke the Wabash record for total tackles with 451 over the course of 45 games, one of five individual records he holds. Pynenberg's senior season was an assault on both opponents and the Wabash record book. He set four school marks that season while helping Wabash to a second North Coast Athletic Conference title and a trip to the quarterfinals of the NCAA Tournament. He was a two-time NCAC Defensive Player of the Year. Another of the all-time great defensive football players at Wabash, Schoettle was a two-time All-American and three-time All-Indiana Collegiate Athletic Conference selection. He ranks in the top-10 in five different career categories in the Wabash record book. He still owns single-season records with six forced fumbles and four blocked kicks. Schoettle ranks fourth in single-season interceptions and is tied for fifth all-time. Snively and Wiesehan were inseparable as wide receivers for the Little Giants from the day they walked onto campus together. Both were four-year letter winners and each caught passes in all 36 games in which they played; the only NCAA Division III players make that claim at the time. Snively finished his career with 139 catches for 2,227 yards and 15 TDs, which ranks eighth on the all-time receptions list and 10th in career receptions. He was two-time all-conference selection. Snively also starred on the baseball diamond for the Little Giants. He earned All-ICAC honors in 1991 and 1993 and still ranks fourth in career stolen bases (44) and is tied for 11th in runs scored (98). Wiesehan set the NCAA Division III record for career all-purpose yards with an average of 16.0 yards per play, a mark that still stands today. He tallied 2,858 receiving yards, 680 kickoff return yards, and 491 punt return yards in 36 games. Wiesehan ranks fourth in career receiving yards among Wabash players and fifth in receptions. He earned All-America honors in 1993 and was a two-time All-ICAC selection.